The Bottle Shop at Stapleton | Fine Wine. Craft Beer. Artisan Spirits. We kicked off our ’11 Tasty Days of Stapleton’ countdown to December 24 with an in-store tasting of three exceptional Bourbons from Four Roses. This distillery traces its history back to 1884 and was one of only six distilleries granted permission to operate through prohibition to produce Bourbon for medicinal purposes. It was one of the best-selling Kentucky Straight Bourbons in the United States until it was purchased by Seagrams in 1943 and discontinued. Now the brand is under new ownership again (Kirin Brewing Company) and is enjoying a renaissance here to match its popularity abroad. Whether you need a great value Kentucky Straight Bourbon ($21) to craft some delicious Bourbon Balls or spike the egg nog, or a rich, complex, warming spirit to sip (the Small Batch or Single Barrel), Four Roses has your holiday spirit covered. Chime in on our Facebook page and let us know how you enjoy your Bourbon over the holidays! You could win a special in-store discount! 11 Tasty Days of Stapleton! Dec. 18 – Cabernet Sauvignon! Dec. 20 – Oregon Pinot Noir! Dec. 23 – Moscato d’Asti! Dec. 24 – Champagne!What’s your favorite holiday drink, and why? Post on our Facebook page during our 11 Tasty Days (Friday, Dec. 14 – Sunday, Dec. 23) – we’ll choose our favorite entry on Dec. 24 to receive a special discount! At the Denver Wine School we open your mind to the opportunities one might find in a career in wine and spirits. We offer internationally-recognized professional certifications through the Wine & Spirit Education Trust, The Society of Wine Educators and the French Wine Society, both formal and online. While we focus on certification programs, we also offer many terrific courses designed for those who simply want to learn more about wine! Whichever your path, our programs allow you to take this lifelong interest to a whole new dimension! Natalie Guinovart is the owner of Wine for Thought, LLC. She is a WSET Certified Instructor, a Certified Sommelier through the Court of Master Sommeliers, a French Wine Scholar, a Diploma-holder for the London-based Wine and Spirit Education Trust (WSET), and a Certified Wine Educator through the Society of Wine Educators. She earned the prestigious Banfi Vintners’ Award of Excellence for passing the CWE with the highest score on her first attempt. She is currently a Master of Wine candidate. An accomplished writer and educator, Natalie has taught wine and spirits courses at Johnson & Wales University, published numerous articles in Sommelier Journal and co-authored a textbook for the Society of Wine Educators. She has had the privilege to work with such high-level wine entities as Tom Stevenson and Jancis Robinson OBE MW. You will find her approach to wine and spirits education creative, flexible, yet effective, and above all, fun! cellars and personal wine investment. Ashley Vaughters believes that to be a good instructor, one must be a constant student. To learn more about the terrific programs we will be offering at our new wine bistro in 2013, go to www.wineforthought.com – Or pick up a brochure in store! *Cortijo Rioja $10.99 – A lovely, pure expression of Tempranillo (80%) and Garnacha (80%), all estate-grown. A great introduction to Rioja, this medium-bodied, unoaked red is filled with juicy red fruit and a smooth finish. *Casteller Cava $11.99 – The ‘Castellers’ are human towers, a time-honored tradition in the Catalonian region of Penedes, Spain. As always, Cava offers superb value as it is made in the same manner as Champagne. A great sparkler to stock up on for the holidays! *La Cartuja Priorat $15.99 – Priorat is a very unique, mountainous region in Catalonia. The difficult growing conditions means the wines are generally quite expensive; it is unusual to find one under $20, and especially one this highly-rated and delicious! A blend of 70% Garnacha, 30% Cariñena, this is a deep, bold wine for Cabernet-lovers! * Vizcarra Roble Ribera del Duero $20.99 – 100% Tempranillo, but so unlike its softer cousin, Rioja, the region of Ribera del Duero makes intensely colored and flavored wines. ‘Roble’ is Spanish for oak, a nod to the aging in French and American oak that this wine receives. A very fun comparison to the Cortijo Rioja! *SKETCH Albarino 2008 Rias Baixas $76.99 – A $77 Albarino, you ask? This is truly unlike any other wine out there. Idiosyncratic winemaker Raul Perez ages the wine 60 meters under the sea! He believes that “the lack of oxygen, greater pressure and the low temperatures affect the ageing of the wine in a unique way, making it taste unlike any other wine.” This iconic wine is very highly allocated – we only received three bottles and are SO excited about tasting it! We have some exciting, long-awaited news! Construction has finally begun on the new, larger retail space adjacent to our current one. If you weren’t aware, The Bottle Shop of Stapleton is about to harbor many more bottles of wine, spirits, and microbrews! Once the transformation is complete, our current retail space will undergo renovation to become your new favorite local hangout. We are building a wine bistro with a wine bar that will serve wonderful wines and spirits by the glass along with a fine selection of cheeses, salumi, and other tasty treats. In addition, this space will be home to a new wine school! More details will follow on both fronts.. in the meantime make sure you are following us on Facebook and/or Twitter for fun updates as well as special holiday discounts and more! 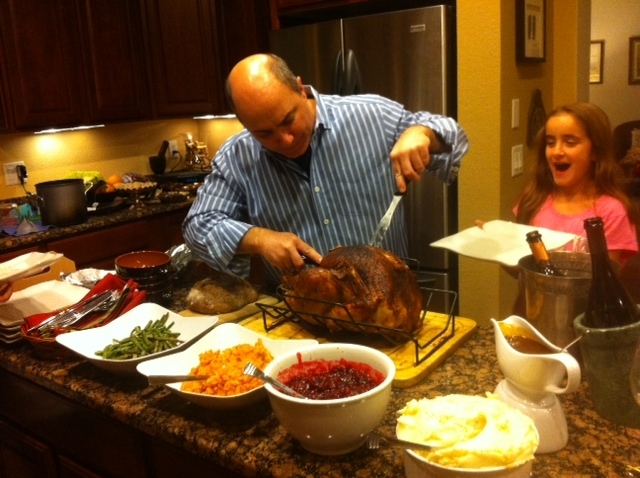 This year I had the privilege to join friends and their family for Thanksgiving dinner. It was a traditional table – a gorgeous, lacquered turkey, roasted to perfection, accompanied by vibrant cranberry sauce and a rich, savory gravy with fluffy mashed potatoes, tender-crisp, bright green beans and earthy-sweet brussels sprouts, plus sweet potatoes sans sickeningly sweet marshmallows, and, of course, a moist, herb-tinged stuffing. We were a room full of wine geeks, and everyone brought top-notch wines. I was immediately blind-tasted on a white wine that confounded me with its immense core of concentrated fruit – it was ultra-ripe nectarine, lemon curd, honeyed green apple pie – all very dense, ripe fruit but with tongue-tingling acidity. Full-bodied, with clear evidence of oak and lees stirring to impart richness, body, and flavor… my mind never wandered to Pouilly Fume, and certainly not a 2005. I was thinking more premium South African Chenin Blanc (which often see oak and lees treatment). I should have paid closer attention to the alcohol (it was only 13% but seemed a bit higher to me), as this indeed was the 2005 Majorum Pouilly Fume from Michel Redde ($30). Spectacular. It was consumed before the turkey was carved, so I cannot comment on its affinity for Thanksgiving, but it did pair beautifully with a crumbly goat cheese. 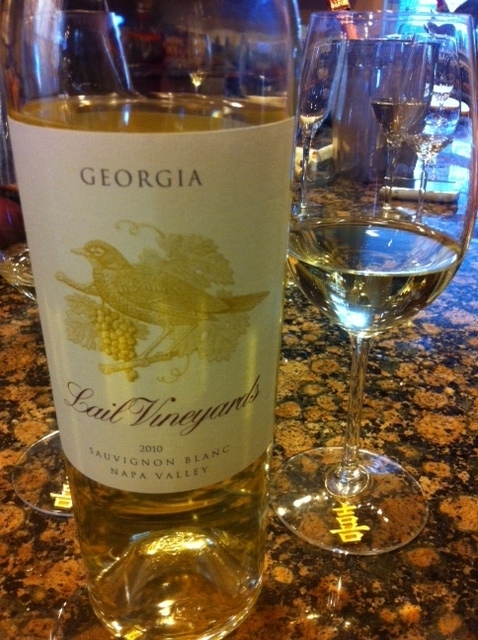 Our next victim was the 2010 Lail Sauvignon Blanc ‘Georgia’ from Napa Valley ($75). A complete departure from the Majorum, full of buttered pineapple, mango and banana flavors and an unctuous texture. A hedonistic style which paired best with the goat cheese layered with fig jam to match its sweet fruit. We then moved onto bubbles – a sprightly, pale pink Ruinart Rosé Brut NV – always a treat. While there wasn’t ham or smoked salmon nearby, my mind immediately wandered to those salty, smoky treats upon which the tangy bubbles could burst. As the turkey emerged from the oven and readied itself to be sliced and diced, I opened my wine, a 2003 Mommessin Clos de Tart Grand Cru. There is a back story to this wine… The Clos de Tart is the wine that stole my heart as a fledging wine wannabe eight years ago. I happened upon a tasting at Del Frisco’s (for the “trade”) and upon arriving, a friend handed me a glass of wine. She said, “Try this.” I did, and immediately fell against the nearby pillar to keep upright. There are no words for that first magical glass. It was the 2002 – a legendary vintage in Burgundy. I didn’t know enough about wine then to understand that 2003 was a very, very atypical vintage in Burgundy. Some of you may recall the extreme heat wave that stifled Europe that year? Those poor Pinot grapes had a hell of a time staying true to themselves. I bought three bottles (at $190 a pop) of a wine that essentially tasted like massively oaked New World Syrah. No matter. It was the symbolism of it that made it worthwhile. This was my last bottle and I was more than happy to share the nearly 10-year old Syrah-in-Pinot’s-clothing with my wine-loving comrades. Unfortunately, it was not very well-received by my traditionalist friends, and the 14.5% alcohol didn’t do most of the dishes any favors. Then… (timpani roll, please) I opened Carl’s Cellar Selection. 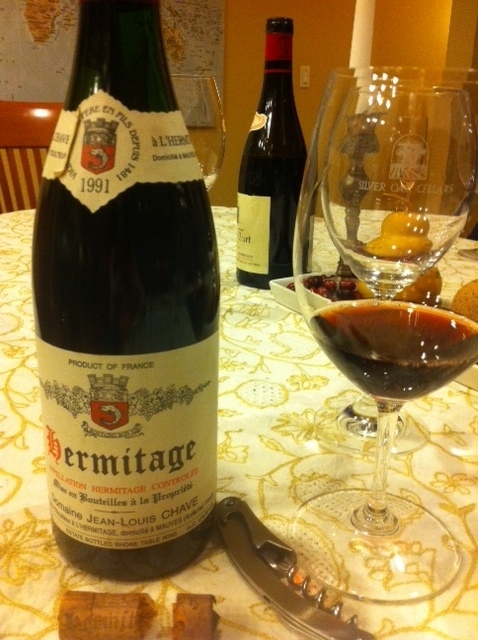 A 1991 JL Chave Hermitage ($NA, over $500 at auction). Be still my beating heart. 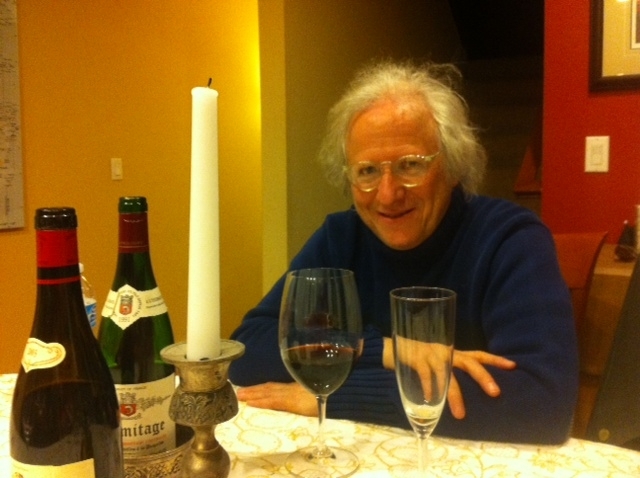 I have three favorite wines – Northern Rhone Syrah (Hermitage being the apogee of this region), Loire Chenin Blanc (Vouvray and Quarts de Chaume in particular), and Riesling from anywhere, in any style, as long as it’s good. Hermitage is rare and expensive, thus I have only had it a handful of times, and only once this old. The texture of this wine was surreal; a thick satin drape flowing across the tongue. The finish lasted at least a full minute and a half before beginning to wane. The flavors were smoky, with cured meat, iodine-y, dried peppercorn, dried leather, dried blueberry and black raspberry, and just a touch of dried purple flowers. A very savage, animal wine that was perhaps too masculine for our little white bird and certainly too dry for the sweet-tart cranberry sauce. But I adored it with the savory flavors of the gravy, mashed potatoes, and stuffing. And on its own I sipped it at leisure, relishing the way it evolved and coated my palate with the most intriguing flavors. 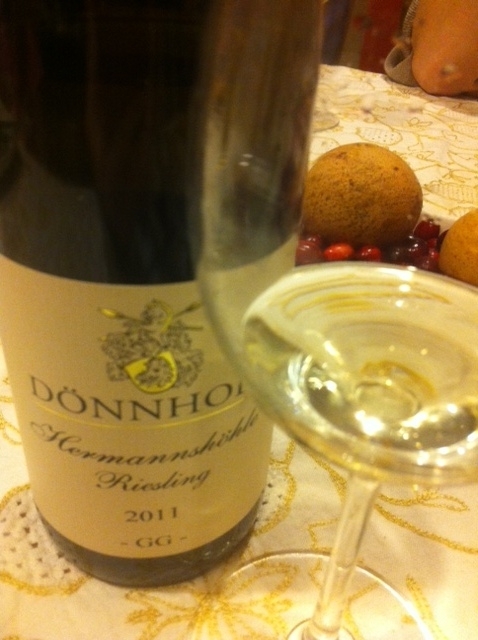 A complete change of pace followed: A stunning 2011 Donnhoff Riesling from the acclaimed, “Grosses Gewachs” (essentially Grand Cru) Hermannshohle vineyard in the Nahe region of Germany ($57). An instant wake-up call, this wine pierced right through my palate, singing with clarity and crispness. You can’t help but smile, giggle, even, when something this pristine graces your palate. It was just lovely with everything on the table, reinforcing my previous findings that Riesling is the perfect food wine. Sweet, savory, spicy, salty, you name it, Riesling just works. And, as is evident from my gushing, at its best, it is also freaking delicious. Sweet notes to end the night included lemon meringue pie, pumpkin pie, and French silk pie. I had a sliver of each – who could resist? 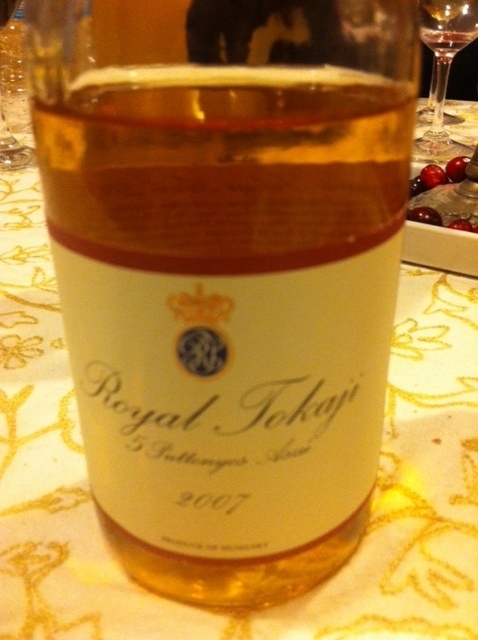 A 2007 Royal Tokaji Co. Tokaji dessert wine from Hungary (6 Puttonyos) was our gluttonous ending. A ubiquitous but consistently great offering. I hope everyone had a marvelous dinner with loved ones, new and old, and wines to be thankful for (also new, and old). What has been said about Pinot Noir that could possibly be elaborated on by little old me? All roads lead to Pinot. It’s the Holy Grail of wines. It’s a frustrating, finicky grape to grow and even more difficult to make into stunning wines that will become even more provocative with age. I’ve heard all of these before, and they’re all true, to a greater or lesser extent, depending on who you’re talking to. Yes, Pinot Noir is a difficult grape to grow, requiring just the right type of soil and amount of heat and sunshine to flourish. Other grape varieties, such as Cabernet Sauvignon and Chardonnay, are much more adaptable than our darling Pinot. Ever wonder why you can find great Cabs and Chards for under $15 but not many great Pinots at this price? This is why! But when grown in the right location and vinified in the right hands, Pinot is magical and well worth the extra dough. There is no question that Burgundy is the height of quality and expression for Pinot Noir. The Cote d’Or is located in the northeastern part of France, around 200 miles southeast of Paris. This band of limestone hillsides is perfect for prime Pinot, particularly from the northern section, the Cote de Nuits (the Cote de Beaune to the south is best-suited to premium Chardonnay). In fact, the world’s “most important wine producer”, Domaine de la Romanee Conti (or just DRC), with their astonishing Grand Cru wines, is located on this “Golden Slope” and testament to the otherworldliness that Pinot can achieve. Of course, few of us will ever actually taste these wines, but one need not shell out tens of thousands of dollars to become acquainted with the beautiful wines of Burgundy. 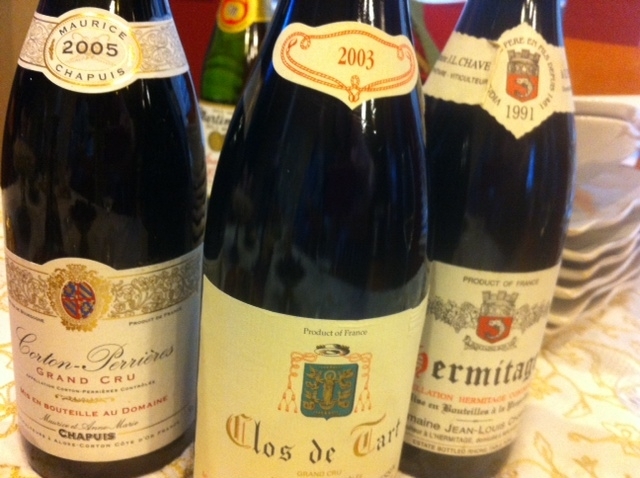 What are Burgundies like, anyway, and how do they compare to our beloved “New World” Pinots? Well, to start with, the climate and soils are quite different than other major regions of the world that grow Pinot Noir, such as Willamette Valley in Oregon and Russian River, Carneros, and Santa Rita Hills in California. The limestone in the soil combined with Burgundy’s northern continental (cool) climate equal elegance, finesse, lighter body, lower alcohol, and fresher acidity. When Pinot is allowed to slowly ripen in this way, the flavors develop differently, showing more earth, mushroom, and restrained red fruit flavors as opposed to the lush, ripe red and sometimes plum fruit and cola notes common in warm, fertile New World regions. The density of New World versions are also able to stand up to heavier oak regimens while many Burgundies are so ethereal that a light kiss of oak is all that is needed to add structure and complexity. Finally, it’s the textural difference between these two main styles that really sets them apart. Don’t get me wrong – there are plenty of phenomenal New World Pinots out there to enjoy (just take a look at our Pinot section! ), but to understand the satin heart and silky soul of Pinot, all roads lead to Burgundy. Jean-Philippe Marchand Bourgogne Pinot Noir 2010 $19.99 – This is a great entry-level ‘Bourgogne’ (the French spelling for Burgundy.) Most French wines don’t state the grape variety on the label, although legally they are allowed to. This forward-thinking producer has kindly stated ‘Pinot Noir’ on the label. Otherwise, you would simply have to know that if it says ‘Bourgogne’ and it’s red, it’s Pinot Noir, and Chardonnay if it’s white. This is a wonderfully pleasant drink, medium-bodied and fresh – best with roasted chicken and potatoes, baked salmon, and mushroom risotto. Dupont Tisserandot Gevrey-Chambertin 1er Cru ‘Lavaux Saint-Jacques’ 2009 $96.99 – Moving up the quality ladder to a Premier Cru (1er Cru on the label, with the vineyard name following) is this spectacular offering from the heralded 2009 vintage. A baby, yes, but “ready” to drink now, with decanting and a delicious meal – roast duck or other game birds will do quite nicely, perhaps with some roasted root vegetables alongside. 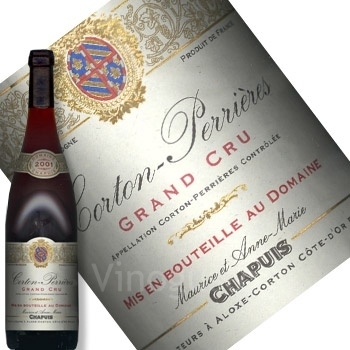 Maurice Chapuis Corton-Perrieres Grand Cru 2005 $110.99 – Grand Cru wines represent the top tier in Burgundy, and on the label “the cheese stands alone” – that is, the name of the Grand Cru vineyard (in this case, Corton-Perrieres) is the only information you will find, with the words GRAND CRU directly below. The 2005 vintage is one of the best in the last decade, and 7 years on this wine is showing remarkably well, developing the characteristic earthy complexity, the tannins weaving themselves into a basket made of silk. Yes, it’s pricey, but it’s the holidays. Time to splurge and see what this “Holy Grail” of wines is all about. Working with a team of lifelong wine lovers is such a treat. Between all of us we have had hundreds of Thanksgiving dinners which have offered plenty of opportunity for trial and error when it comes to pairing wines with the wide range of flavors at the table. Today we put our heads together and shared our most memorable Thanksgiving wine experiences. We selected eight special wines (not the “everyday wines”) to feature at our tasting this weekend. We hope to see you there and that some of these will find a place on your holiday table. Below, a little discussion about the complex flavors often encountered at Thanksgiving and why the wines we have chosen work so well. Turkey, like chicken, is really just a blank slate for an accompanying sauce. At Thanksgiving, that usually means sweet-tart cranberry sauce, but can also mean a rich gravy made from the pan drippings (perhaps even both!). A savory stuffing is common as are green bean and sweet potato casseroles, the latter generally topped with gooey marshmallows or perhaps a crunchy streusel. Whether you’ll be enjoying a traditional Thanksgiving dinner or something with a more worldly flair, it is challenging to find one wine that will pair well with such a hodge-podge of sweet-salty-tangy-creamy flavors. Zinfandel is a great place to start, however. With its bold, massive fruit core, nuances of sweet and savory spice and generally well-rounded, soft tannins (compared to, say, Cabernet Sauvignon) this has been my hands-down winner year-in, year-out (and I don’t normally drink Zinfandel!). Zinfandels usually have a touch of residual sugar (natural grape sugars that are left unfermented in the finished wine) which means it won’t clash with the sweet potato casserole or cranberry sauce the way that completely dry wines will. It is bold enough to stand up to hearty fare like a hefty stuffing and rich green bean (or other creamy) casseroles. And its flecks of spice play all sorts of flavor fireworks with the myriad of spices encountered at the Thanksgiving table. 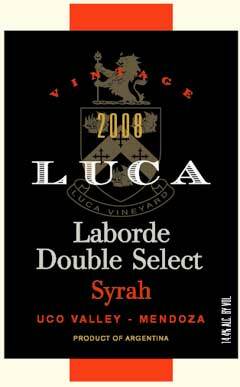 Along these lines fall a red Rhone-style blend (Grenache-Syrah-Mourvedre), preferably a ripe, New World style. Here you find the sweet, juicy red fruit of Grenache, the sturdy backbone and richness from Syrah, and the herbal-meaty tinge from the Mourvedre. Add to this the savory spice elements that both Grenache and Syrah bring to the table, and you have all of the elements for a successful Thanksgiving pairing. Pinot Noir is often cited as being a great all-purpose Thanksgiving wine. Choose one from Russian River Valley or Carneros in California over the leaner versions from Oregon or Burgundy. The effusive cherry fruit, substantial, satiny texture, and light hints of oak spice will best complement the flavors of Thanksgiving. Aromatic, oak-free white wines are ideal for Thanksgiving, because, unlike red wines, whites wear oak more prominently and may clash with some of these dishes. There are plenty of options here, with Riesling or Gewurztraminer usually the most popular, but don’t overlook Pinot Gris. The reason these work so well is that the purity of fruit and floral aromatics highlight the distinctive flavors of all of these dishes. The crispness of Riesling works particularly well, and is a personal favorite, while others prefer the full body and low acidity that Gewurztraminer offers. The best versions of these for Thanksgiving will have some degree of residual sugar for the same reasons that Zinfandel works so well. Look to Alsace for Gewurztraminer and Pinot Gris, and Germany for Riesling, in a Kabinett or halbtrocken (half-dry) style. Rhone-style whites are also great options, such as Viognier, Marsanne, and Roussanne, or some combination thereof. These tend to have ripe peachy fruit and nutty or honeysuckle aromatics. Again, the best choice is one with little to no oak influence which is most often found in the Rhone Valley itself (White Cotes du Rhone or Chateauneuf-du-Pape for Southern Rhone, Condrieu, or a white St. Joseph or Crozes-Hermitage for Northern Rhone). We will feature all of these styles of wine at our in-store tastings the weekend before Thanksgiving. Finally, the best wine for Thanksgiving, like any meal, is one that is special to you and that you enjoy drinking and sharing with others. Take the time to savor each bite and have fun with the changes the wine brings to each flavor, and vice versa. Perhaps, as I so often do, choose 2 or 3 wines and discover what tastes good to you and your dinner companions. Thanksgiving is truly a golden opportunity to learn about how food and wine interact and what works – or doesn’t – for you. Join us for a tasting of four delicious Australian wines, highlighting some of the best-known regions and varietals throughout the country. Margaret River is a high-quality appellation in Western Australia known for its Bordeaux-style wines, such as this classic blend of Semillon with Sauvignon Blanc. It is a great alternative to the pungent, overt styles of Sauvignon Blanc from New Zealand, or an interesting comparison to the white Bordeaux model. Most of us have had a Penfolds wine at some point in our wine-drinking existence. It’s impossible not to encounter a wine from this mega-producer, but perhaps too easy to dismiss them as being generic and ubiquitous while in fact they are one of Australia’s most consistent and quality-minded wineries. The Thomas Hyland line, which we are featuring on Friday, underlines Penfolds dedication to sourcing the best grapes from the regions where they thrive. Adelaide is a cooler pocket of South Australia, southeast of warmer Barossa Valley, and the wines from this region showcase a more elegant, refined style. d’Arenberg celebrated its 100th Anniversary this year! While they are best-known for their whacky wine names (The Money Spider, The Dead Arm, etc), the ‘Stump Jump’ series is a line of juicy, fruit-forward, easy-on-the-palate-and-wallet wines. We’ll be tasting the Shiraz, a great representation of the uncomplicated Aussie style. *We are also doing a separate, concurrent MANHATTAN tasting using all top-shelf ingredients on Saturday from 4-7pm! South American wines with Rafael Craveiro of Craveiro Imports! Bonarda was once Argentina’s most widely-planted grape variety, a real workhorse grape that was used to satisfy the once-huge domestic demand. Now that exports have risen sharply, producers have begun making Bonarda in a more serious style to cater to global palates. Bonarda is such an easy-to-love grape variety, with soft, smooth tannins and delicious jammy berry fruit. It is great with simple, weeknight meals. Tupun is a reference to Mt. Tupungato, an inactive volcano in Argentina’s Valle de Uco. This high-altitude region is being widely cultivated now that it has been recognized for its superior-quality Malbec grapes with deeper color, lifted aromatics and velvety tannins. Colchagua Valley is considered Chile’s best sub-region for Cabernet Sauvignon. This is their entry-level wine, a superb value. The ACrux is Vina Sutil’s Icon wine, representing the absolute best of Chile’s famous Colchagua Valley. 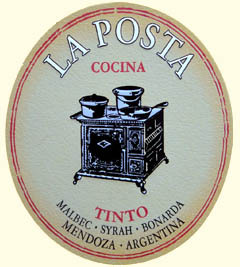 La Posta ‘Cocina Blend’ – the La Posta label is a collaboration between renowned winemaker Luis Reginato and individual winegrowing families. Each label is a unique representation of style and place. The ‘Cocina Blend’ (Kitchen Blend’, meant for drinking at the table) is a delicious mix of 60% Malbec, 20% Bonarda (the Argentine ‘workhorse’ grape), and 20% Syrah with just the right amount of aging in French oak. This is the perfect everynight wine – try it with burgers, pizzas and pastas, and grilled or roasted steak or lamb. Maison Tramier ‘Roncier’ Rouge Vin de France – This is an easy little wine, light-bodied, uncomplicated and smooth – perfect for relaxed sipping on its own or with a simple platter of meats and cheeses. 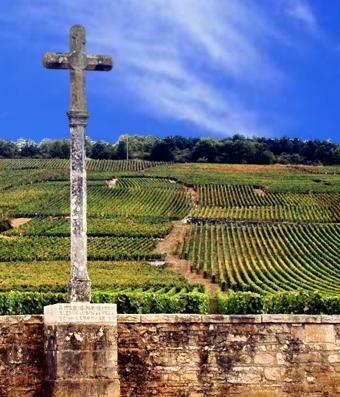 Chateau de St. Cosme Cotes du Rhone ‘Les Deux Albion’ 2010 – New Arrival! 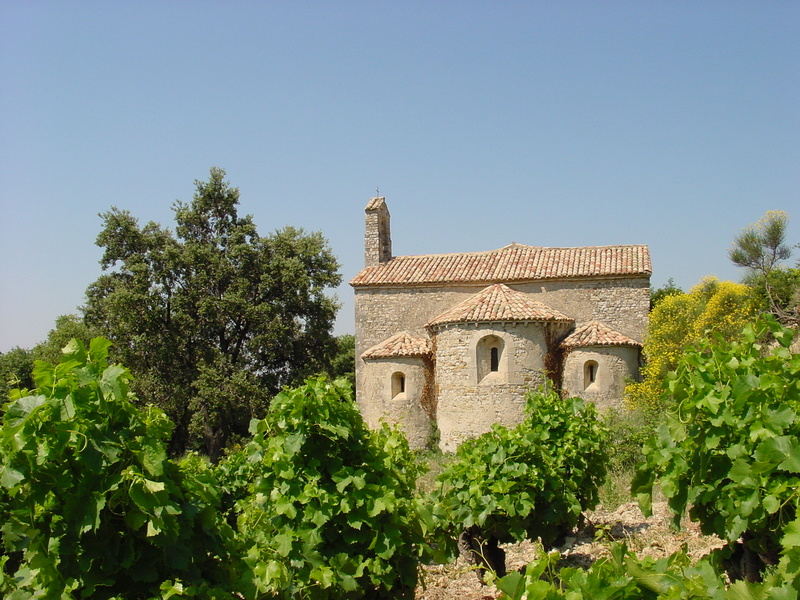 Have you tasted the gorgeous wines of Chateau de St. Cosme? This incredible, historic property can trace its winegrowing history back to 109 A.D.!!! We now have several of these benchmark wines on our shelves; this is but one delicious offering. At Chateau de St. Cosme, there is a tradition for co-fermentation, which is the practice of placing all the different grape varieties (red grapes: Syrah, Grenache, Carignan, Mourvèdre with white grapes: Clairette) into the fermentation vat together rather than fermenting each separately and blending later. No one is really sure how the science of co-fermentation operates, but many winemakers believe it helps to deepen the color, soften the tannins, and lift the aromatics. Whatever they’re doing, it works. Can’t wait to taste this!! Chateau Pezat Bordeaux Superieur 2009 – Oh, yes, my friends, we have yet another great value Bordeaux from the superlative 2009 vintage. This one hails from Chateau Teyssier, of Jonathan Maltus ‘garagiste’ fame on the Right Bank. This is a blend of Cabernet Franc and Merlot, the classic partnership for Right Bank Bordeaux. The wine displays a “flashy” style with pretty black plum and sweet spice notes. 100% estate grown fruit. Phenomenal for the price. Terlato Syrah 2005 Dry Creek Valley, California – Jump on this ready-to-go Syrah from DCV! It is drinking beautifully right now, and at $15 less than what you’ll find elsewhere. Boom.